McEldrew Young, Attorneys-at-Law, will represent whistleblowers reporting to the DOJ, IRS, SEC and CFTC as well as families requiring legal representation due to catastrophic injuries involving medical malpractice, railroads and transportation accidents. [James McEldrew's] team gives us the resources and experience we need to effectively represent our [whistleblower] clients if the government declines to intervene in any of our cases. 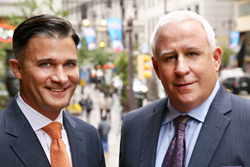 James J. McEldrew, III and Eric L. Young are pleased to announce the formation of McEldrew Young, Attorneys-at-Law, to merge the law practices of McEldrew Law and Young Law Group. The new law firm will have nine attorneys with more than 100 years of combined legal experience. McEldrew Young will represent whistleblowers reporting to the Department of Justice, Internal Revenue Service, Securities & Exchange Commission and Commodity Futures Trading Commission. It will also litigate catastrophic injury cases in the areas of medical malpractice, transportation accidents, nursing home neglect and railroad worker injuries under the Federal Employers’ Liability Act. For McEldrew, it is a chance to offer his contacts in the health care industry, which he has developed over the past thirty years as a trial lawyer in Philadelphia, critical legal representation when they discover health care fraud. “As awareness of the False Claims Act has increased, more of my contacts and consulting subject matter experts are exploring their options as whistleblowers when they witness violations of the law,” McEldrew stated. McEldrew and Young began working together when McEldrew was approached by a contact in the health care industry who wanted to report fraud to the government. After joint representation of several whistleblowers, discussions about joining forces followed. “Formalizing my relationship with Eric is the first step to doing more work on behalf of clients in what is a very interesting and challenging area of the law,” said McEldrew, a past President of the Philadelphia Trial Lawyers Association. The False Claims Act allows whistleblowers, known as relators, to proceed with qui tam litigation on behalf of the U.S. Government after the Department of Justice decides it is not interested in pursuing a lawsuit based on the information provided by the relator. Eligible relators may be entitled to receive between 15 and 30 percent of the government's recovery from the lawsuit. In order to facilitate future growth, the firms moved into new offices in September 2014. McEldrew Young is now located at 123 S. Broad St., Suite 2250 in Center City, Philadelphia. Young Law Group is a nationally renowned whistleblower law firm representing clients reporting violations of the law to the U.S. Government. It was started by Eric L. Young, who represented the first individual to receive a mandatory tax whistleblower award from the IRS under section 7623(b). McEldrew Law was started by James J. McEldrew, III in 2010 and represents clients suffering catastrophic injures because of medical malpractice, transportation and commercial truck accidents as well as railroad workers injured on the job.